The DHP Bali Metal Bed has a timeless look that will compliment any bedroom décor. 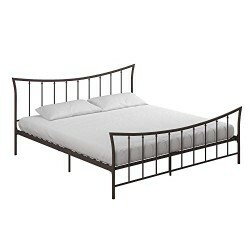 The brushed metal frame and curved headboard and footboard provides a simple yet classic look. Complete with metal slats and supporting legs, the DHP Bali Bed offers support and durability for a restful night’s sleep. Available in three size, the DHP Bali Metal Bed is a stunning addition to any bedroom! Accommodates any standard king mattress. Mattress sold separately. King bed dimensions: 83″L x 81.5″W x 39.5″H. Shipping dimensions: 82.5″L x 35″W x 3.5″H. Gross weight: 77 lbs. Weight limit: 500 lbs.